Members of the Ricart family have been “avid Harley-Davidson riders for years.” Now, they will be able to bring that passion for motorcycles into their business. Ricart Automotive on Tuesday announced it has acquired A.D. Farrow Co. Harley-Davidson, which it noted is America’s oldest Harley dealership. Ricart, noting that the acquisition will bring “mobility to next generation of riders,” said in a news release that the two companies will grow their automotive services, further expanding into the lifestyle electric vehicle ownership market and the traditional Harley-Davidson products. Harley’s plans to diversify its product line by developing more electric scooters, bikes and vehicles will meet urban customers’ new demands, Ricart added. In announcing the acquisition, Ricart Automotive noted that it will assume majority ownership of A.D. Farrow Co.’s three Columbus franchises and added that the expansion marks Ricart’s first move away from the Ricart Automotive Mega Mall in Columbus, Ohio in 10 years. “We’re excited to get to know the A.D. Farrow employees and their families and to take on the next chapter of this historic brand," Ricart Automotive Group president Rick Ricart said in a news release. “I have known and admired the Ricart organization all my life,” said Bob Althoff, the previous owner of A.D. Farrow Co. Harley-Davidson. Altholff has led A.D. Farrow for the last 17 years. A previous Auto Remarketing article includes more information on Ricart Automotive, and another covers Ricart's new Express Checkout service. The Dave Cantin Group (DCG), a dealership merger and acquisition firm, expanded its management team to meet a growing demand for services in key regions of the U.S.
Firm founder and chief executive officer Dave Cantin highlighted in a news release this week that the move nearly doubles DCG’s national team of regional and district managers. DCG’s national team of M&A professionals now work from regional offices in New York, California, Florida, Illinois and Texas. Mark Dwyer, previously managing director of DCG’s Midwest regional office in Chicago, has moved to DCG’s Madison Avenue headquarters in New York, where he joins William “Woody” Woodward to co-manage the Northeast region in one of the firm’s busiest offices. Scott Worthing will succeed Dwyer as managing director of the Midwest region. In addition, Chad Goodson has been appointed a managing director for the Southeast region, where he will co-manage the regional office with Dan Simonson. Based in the Miami-Fort Lauderdale area of Florida, the Southeast is another of the firm’s fastest growing regions. Fred Sherwood and Alex Covino also have joined the company as district managers in the firm’s West region. Based in Irvine, Calif., the region is led by managing director George Pero. Worthing has more than 30 years of experience in dealership financing. He began his career with Mercedes-Benz Financial, where he held a number of senior management positions in dealer relationship management. He moved from captive finance to commercial banking in 2008, joining M&T Bank in Philadelphia as administrative vice president of dealer financial services. M&T Bank later appointed him to open an expansion market in Chicago through its SunTrust Bank group working closely with dealers in the Midwest. “DCG has quickly established a solid reputation as the go-to dealership M&A firm in North America, and I’m excited to be part of the management team at such a fast-growing company,” Worthing said. Goodson comes to DCG from Cornerstone Executive Capital, where he served as a managing director for more than 10 years. At Cornerstone he counseled dealers on organizational development, performance management, valuations, sales and service. He previously worked as a client development manager at CARFAX where he directed leadership and development activities with the company’s top dealer groups and vendor partners. Prior to CARFAX, Goodson was in brand performance management for GP Strategies Corp., where he represented General Motors in the company’s Southeast region. Sherwood has worked in the automotive industry for 40 years, including significant experience with Chrysler in its dealer network office on the West Coast. He spent the last three years managing his own private consulting business and has been instrumental in consummating numerous buy/sell agreements. Covino joins DCG with experience in both financial and real estate markets. Early in his career, he worked as an equity trader responsible for the active management of short-term-oriented portfolios under continuously changing market conditions. Covino later worked in residential and commercial real estate where he built a high-output real estate investment company that helped bridge the gap between conventional sellers and institutional investors. “The rapid growth in demand for our services over the past year has allowed us to expand our team of M&A professionals to include a group of highly effective managing directors at five regional locations throughout the U.S.,” Dave Cantin said. “This is the most experienced team of M&A experts in the country — a team with considerable expertise both on the retail and wholesale sides of the business," he went on to say. Friday is the most popular day for buyers to visit a dealership, while 59 percent of car buyers spend time doing online research. And six out of 10 shoppers are undecided on a specific vehicle when they enter a dealership. If dealers want statistics like those on understanding their market and their core target audience, they can get a good amount of it from a new study from global data company, Freckle IoT. The company released a new quarterly “footfall” report titled, “Freckle IoT Path to Purchase: U.S. Automotive Footfall Report,” which covers the fourth quarter of 2018 for the United States. The company also released a report covering the Canadian market. —The average consumer is visiting more than five dealerships before buying. —Consumers will spend an average of six months researching a vehicle they will potentially buy. —Buyers like to stay close to home. The study noted that some methods of media spend are not that effective. Only 18 percent of shoppers say promos drive them into a dealership. But in measuring which advertising is most influential to car buyers, online ranks as the most persuasive method of influencing buyers. Thirty-eight percent said online advertising was most influential in their purchase, 15 percent said television, 4 percent said newspaper and 2 percent said radio. Freckle IoT released the report in partnership with Killi, which is a consumer application available on iOS and Android that lets potential buyers control their identity and engage directly with companies that require data to operate their businesses. In conducting its survey over 30 days, Freckle IoT surveyed more than 8,000 of its customers using the Killi app to determine specific automotive shopping habits. Some of the more obvious results of the report include the statement that price and reliability are the top priorities for car buyers. Another result that might not be surprising: Technology is extremely important in the buying process for millennials. Ninety-two percent of that group owns smartphones. But although those results might be obvious, they are still important. “This is incredibly important to note because it modifies how, where, and why your marketing spends matter,” the report said. For decades, Japanese-brand automakers have made investments in the U.S. economy and U.S. workforce. That commitment has paid off for U.S. workers. According to an employment study that Rutgers University economics professor Thomas Prusa prepared for the Japan Automobile Manufacturers Association’s U.S. office, those Japanese automakers generate 1.52 million jobs throughout the United States. The study, titled, “The Contribution of the Japanese-Brand Automakers to the United States Economy,” shows continued nationwide growth in direct, dealer network, intermediate and spin-off employment. As of late 2017, according to the report, Japanese-brand automakers directly employed more than 92,000 workers. Also, their dealer network employed more than 355,000 workers. “In addition to their direct and dealer employment, these companies support approximately 250,000 jobs in the U.S. automotive supplier network, actively strengthening the American manufacturing base,” Prusa said in a news release. — More than 781,000 U.S. jobs are generated by the Japanese-brand automobile companies’ U.S. production facilities, R&D centers and headquarters. — More than 738,000 U.S. jobs are generated by the Japanese-brand automobile companies’ dealer network. — The contribution of 1.52 million private sector U.S. jobs makes Japanese-brand automobile companies among the largest job creators in the United States. — Total annual compensation from the jobs that Japanese-brand automobile companies create in the United States is more than $109 billion. — Personal income taxes from these jobs are almost nearly $16 billion, the study estimates. Manny Manriquez, general director of the Japan Automobile Manufacturers Association’s U.S. office, noted in a news release that Japanese-brand automakers' cumulative direct U.S. employment has risen by almost 28 percent since 2011. That is much higher than the 6-percent growth rate in overall U.S. manufacturing employment over the same time period, Manriquez noted. Manriquez urged leaders in Washington, D.C. to keep those numbers in mind as they consider trade policies affecting the American auto industry. Speaking of which, several dealer organizations have voiced on similar trade matters. More on that here. 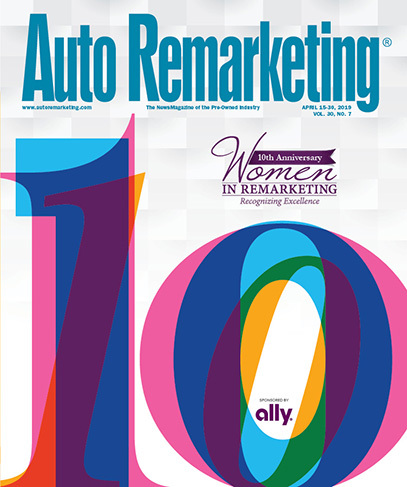 As part of Auto Remarketing’s annual issue honoring The Best CPO Dealers in the USA, we reached out to automakers across the board to gather their respective top 10 lists of dealerships with the most certified pre-owned vehicle sales. Those brand-by-brand sales rankings, based on full-year 2018 sales, can be found below. Listings include dealer name, city/state (where provided) and 2018 CPO sales. Dealer organizations are becoming even more roiled over what’s unfolding in Washington, D.C., regarding whether imported autos and auto parts represent a national security threat. Even after taking into account the mitigating effects of the new United States Mexico Canada Agreement (USMCA), the National Automobile Dealers Association said tariffs on autos and auto parts under Section 232 of the Trade Expansion Act of 1962 would still be extremely detrimental to consumers and the U.S. economy and cause significant vehicle-price increases and job losses, according to research by the Center for Automotive Research (CAR). American International Automobile Dealers Association president and chief executive officer Cody Lusk then issued a strong statement on Tuesday in response to the Department of Commerce’s investigation into the matter. “Late last night, after nine months of waiting, the Department of Commerce finally submitted to the White House its findings on whether imported autos and auto parts constitute a national security threat to the United States,” Lusk said. “Unfortunately, the report has not been made public, highlighting, once again, the bogus nature of this investigation into America’s 9,600 international nameplate dealership franchises, their 578,000 American employees and millions of customers. In July, Lusk testified in support of the international auto retail industry during the U.S. Commerce Department’s 232 National Security Investigation Hearing. His comments focused on the 578,000 jobs provided by America’s 9,600 international nameplate auto dealers in their communities, the vehicles they sell to consumers, the billions in state and local taxes they generate, and how they and their customers would be negatively impacted by new vehicle tariffs. NADA also was involved in that July proceeding, and late last week that organization reiterated what it presented to policymakers along with new information. — As many as 366,900 U.S. jobs will be lost, including as many as 77,000 franchised dealership jobs. — U.S. light-duty vehicle prices will increase by $2,750 on average. — U.S. new light-duty vehicle sales will drop by up to 1.3 million units per year. — Many consumers will be forced into the used-vehicle market. — The cost of maintaining and repairing vehicles will go up. In fact, NADA emphasized that CAR found that broad-based Section 232 autos and auto parts tariffs would still be responsible for more than 90 percent of the total economic harm caused by implementation of the collective trade policies currently being pursued. Welch, who testified on the topic last July before the Department of Commerce, again encouraged the administration to avoid imposing broad-based tariffs on autos and auto parts. “We should continue to work together to address genuine trade concerns, but without hurting American consumers and small businesses in the process,” Welch added. Beyond the dealer organizations, the developments are frustrating the Association of Global Automakers, a trade association based in Washington, D.C., that represents the U.S. operations of international automakers, original equipment suppliers and other automotive-related companies and trade associations. “If it is going to be the policy of the U.S. government that the price of autos and auto parts should increase by as much as 25 percent because of new tariffs, the American public deserves to know that as soon as possible. Full and rapid disclosure will allow American consumers, auto industry stakeholders and Congress to debate the merits of the policy and take actions as needed,” said John Bozzella, president and CEO of Global Automakers. “On the other hand, if the persistent reports that the Commerce Department’s investigation into auto trade will recommend tariffs of 25 percent are in fact wrong, then the American public should also know that as soon as possible,” Bozzella continued. “The prolonged uncertainty about these tariffs freezes investment decisions, makes planning for the U.S.-Mexico-Canada Agreement next to impossible and does incalculable damage to the U.S. auto industry,” he went on to say. “Automotive trade does not imperil national security. It strengthens our competitiveness and benefits consumers. There is no compelling need to hide the recommendations made to the president, or to restrict trade in a sector that supports the jobs of 10 million Americans,” Bozzella concluded. Mobile continues to dominate. That is definitely the case when looking at visits to automotive manufacturer and dealer websites, according to global marketing technology company IgnitionOne. The company released a report showing that more than 50 percent of traffic to automotive manufacturers and dealer websites across 50 countries was attributed to smartphones in 2018. Site visits, however, are down by 11 percent year-over-year for North America. But the good news is that automotive marketers are making advancements in customer journey optimization, with targeted interactions and website personalization. That means site visitors are more engaged than in previous years. That information comes from IgnitionOne’s Q4 2018 Automotive Industry Report, which highlights year-on-year growth in categories such as site visits, engagement metrics, lead volumes and segment trends. The report notes that global site visits grew 5 percent from the fourth quarter of 2017. Mobile site visits grew by 20 percent during 2018. On the topic of customer engagement, IgnitionOne reports that engagement is “proving the importance of quality over quantity.” Globally, average engagement increased by 8 percent from last year. Desktop engagement showed the most prominent increase, but mobile device engagement grew by 12 percent. In other news from the IgnitionOne report, SUVs continue to be the preferred vehicle of the future. SUVs also continue to dominate in the area of site engagement. That engagement increased by more than 20 percent year-over-year and 26 percent within mass-market brands. That included a 3-percent increase in engagement for luxury SUVs. The report breaks it down even further by stating that small sport engagement increased by 31 percent; 20 percent for the standard sport SUV. The report also stated that in North America, uncertainty for car sales exists for this coming year, and potential increases in new vehicle prices because of tariffs and an increase in interest rates are two reasons. The report adds, however, that low fuel prices and increases in fuel efficiency help the SUV and truck segments. Based on first-party data gathered from more than 350 automotive manufacturers and dealer websites across more than 50 countries, the IgnitionOne report looks at global car trends including website visits, visitor engagement, and cumulative leads. The company notes that Americans view their smartphones about 14 billion times per day, which shows that the smartphone is “undoubtedly the preferred device for research and shopping,” the company stated in a news release. Engagement on mobile increased by 21 percent year over year. But desktop engagement is almost 40 percent higher than mobile. In the fourth quarter of 2018, IgnitionOne notes that marketers are spending more money to drive traffic to mobile devices. IgnitionOne’s report also covered Europe, noting that in the fourth quarter of 2018, more than 50 percent of website visits took place on mobile, reducing desktop visits to 40 percent. “With the increasing ways in which customers can engage with auto brands across different channels and devices, it’s vital for marketers to leverage identity resolution,” IgnitionOne chief executive officer Will Margiloff said in a news release. “It’s crucial for automotive marketers to understand every interaction a customer has with the brand, and personalize the experience per each channel," Margiloff added. If the months in front of us were an abstract painting, most auto dealers viewing it agree about what they see, with a few exceptions here and there. To discover dealers’ concerns — and optimism — about the used-car business in 2019, I interviewed dealers, used-car consultants and auction executives before and during NADA Show 2019. Rarely in these interviews did anyone use the noun “discipline” to describe an essential practice within their 2019 strategy; most talked about it though — sticking to the fundamentals. Those mentioned were inventory management, sourcing, getting cars front-line ready faster, improving used-car marketing and optimizing staff use of inventory management and other technology tools used in the dealership. “We have a strategy to buy a different mix of cars, and we are sharpening our appraisals,” said Jason Church, general manager for Courtesy Volvo of Scottsdale, Ariz. “I think we also have to slow down that process. We have to let the consumer know transparently the vehicle they’re looking at is truly worth what you’re asking for it,” he said. Used car operations consultant Tommy Gibbs agreed. John Napoleon is dealer principal for Carson Car Center Hyundai in Nevada. He sees the used-car market picking up, and he is focusing his used-car operation on increasing inventory turns, adjusting as needed to price fluctuation, balancing inventory mix to include 20 percent certified pre-owned vehicles and sourcing cars from an increasingly expanding reach. “Dealers are really going to have to count on software tools as well, such as vAuto or one of its competitors, to really hone in on sharpening inventory practices, and that is what we’re doing,” Napoleon said. Abdulla Abbadi is pre-owned manager at McGrath Arlington KIA, in Palatine, Ill. He acquires 60 percent of his inventory through auctions and the rest as trades. “Everything is online auctions,” he said. He is stocking large SUVs and luxury makes — vehicles under warranty — to balance his used inventory. The dealership sells 120 used cars a month now, but Abbadi is reaching to sell another 60 to 80 units a month. “Like all dealers, we want to buy the best car for the money, and because we want to keep reconditioning costs down, that means we have to buy as clean a car as possible,” he said. Napoleon agreed faster recon is a critical discipline. The faster a dealer can get cars from acquisition to the sales lot, the more opportunity a dealer creates to sell cars earlier in their prime retail window, he said. David Simches is group used-car director for Crown Automotive Group in St. Petersburg, Fla., and is responsible for used-car inventory across the group’s 15 dealerships in three states. A 2019 initiative is to rally used-car marketing to make online vehicle page views stickier. “Not only does a better online presence increase our credibility with customers but maximizes our results,” he said. Simches also wants to add video clips to vehicle listings that show and explain to viewers how his dealerships’ reconditioning — showing before-and-after images — builds consumer confidence in his cars. Also on his 2019 agenda is changing Crown stores’ appraisal focus so that trade appraisals factor in the value of downstream F&I and service income the new car — and resale of the trade — create. Sourcing quality cars for their lots is a concern almost across the board. “We’re more and more dependent on trading for inventory, because acquisition continues to be a problem,” said Ryan Johnson, general manager for Johnson Auto Plaza in Brighton, Colo. “The market still keeps moving towards trucks and SUVs, and there are not enough of them out there. “We’re working deals to get those trades and obviously, the new-car market is tough, but the opportunity is to source those vehicles for the used-car lot. We’re using Manheim and Ally’s Smart Auction and having to source further and further out geographically,” Johnson said. Church, of Courtesy Volvo, identified the opportunity to sharpen user skills for those who use sales and inventory management tools. He is also focusing on private-party acquisitions. Kelley Blue Book’s instant cash offer program helps him make more of these purchases. At 4.2 million units, there will be 300,000 more lease returns in 2019 than there was in 2018, according to a recent analysis piece in Auto Remarketing by Anil Goyal of Black Book. Many of these cars will flow to dealers, who will purchase them for remarketing as certified pre-owned vehicles. Manheim, a Cox Automotive brand, noted in Auto Remarketing late last year that for the first half of 2018 that 43 percent of all vehicles sold were to digital buyers using one of its digital platforms. Digital offsite sales, transactions happening outside a physical auction location, grew 39 percent over 2017, the company said. Online auction ACV Auctions, which recently announced $93 million in funding to grow its business, is already selling 10,000 wholesale vehicles a month on its online auction platform. “It’s a 20-minute digital auction, so it is fast paced,” said chief executive officer George Chamoun at NADA while a live ACV auction played out on his smartphone. “Sold” alerts clicked off steadily as he talked. “This auction shows 61 dealers bidding, and already we have 16 bids on this 2010 Mercedes with 100,000 miles. It’s a great car for one dealer; and for another, it’s not the car he or she wants,” Chamoun said. ACV provides online bidders with a full vehicle condition report featuring 50 vehicle photos, including undercarriage and opened fluid reservoirs so buyers can observe any tale-tell signs of mechanical issues those systems’ fluids might be telegraphing. Chamoun said these reports help dealers assess each vehicle’s estimated recon cost, which helps them evaluate a vehicle’s potential profitability. “For some, these cars are 98 percent close to (sale-ready),” he said. Paul Lips, ADESA’s chief commercial officer, agreed that dealers buying at auction are more selective. “They want to buy those vehicles that are front-line ready. Dealers want to get those cars to their lots in two to three days and then differentiate themselves with the right level of recon that translates into a better sales percentage,” he said. As many dealers have pointed out, used cars aren’t necessarily scarce, but are not the kind of used cars franchised dealers want on their lots. “Tell me a time in history when they were not,” said Gibbs, a consultant. “That said, the alternative used-car businesses like Carvana and Texas Direct do disrupt the market,” Gibbs said. “The industry’s stress level will increase as more of these operators come on board — they have lower recon costs than franchised dealers, and they don’t add in packs as new-car dealers do. Crown Automotive Group’s Church agreed: “You know, we get used to things in this business, and when you get complacent you get slow. We need to be sharpening the saw all the time,” he said. Auto dealers looking forward to increased traffic at tax refund season might be in for an unpleasant surprise this year. Last year’s tax reform legislation is part of the reason that early refund amounts are down from last year, according to a recent Autolist study. Also, younger buyers are less knowledgeable about the legislation, and those younger buyers have been the ones who were most likely to spend their refunds on a vehicle, according to Autolist. In late January and early February, Autolist surveyed 1,838 current car shoppers to see how they planned on spending any of their tax refund on a new or used vehicle this year, if at all. Fifty-nine percent of respondents between the ages of 18 and 28 said they planned to use all or some of their refund to get a new or used vehicle this year. That compares to just 26 percent of shoppers ages 66 and older who said they planned to do the same. Across all age groups, 43 percent of respondents plan to spend all or some of their tax refund on a vehicle this year. One reason for the different results between age groups is that younger buyers rely more on their annual tax refund to supplement their incomes. Older buyers with higher incomes don’t need their refunds as much for vehicles and other large purchases. Another factor: Optimism. Thirty-nine percent of shoppers between 18 and 28 years old expected an increase in their tax refund. Just 14 percent of consumers over 65, however, expected their tax refund to increase. Thirty-nine percent of consumers across all age groups expected their refund to increase this year. If early returns are any indication, the younger crowd might be in for a bummer when they learn the amount of their tax refunds. During the first week of returns this year, according to Autolist reporting IRS data, the average tax refund was down 8.4 percent, and the number of people receiving refunds at all dropped by a quarter. Autolist notes that much of that drop is because of the tax reform legislation. Many Americans received a tax cut because of the legislation. But tax filers, especially if they did not change the amount they wanted withheld from their paychecks, could see a noticeable change in the size of their refunds. Older consumers were more aware of that than younger ones, according to Autolist. That could cause dealers to see a drop in expected business. Sixty-four percent of the over-65 group said they knew the legislation could change the size of their refund. Just 45 percent of 18-to-28-year-old group said they were aware of that. Now, those younger buyers who had been counting on a larger refund might have to delay their trip to the dealership. But Autolist believes that might not be such a negative development. Autolist says “experts agree” that buyers might not get the best deal on a new or used car during tax season. The auto industry attributes strong months after President’s Day in February and before Memorial Day in May to tax refund checks, according to Autolist. Because of that demand, the company says, fewer dealers offer sales or deals, so consumers should wait until the end of May to do car shopping, Autolist says. Younger shoppers aren’t aware of that. Fifty-eight percent of consumers 18 to 28 years old believed tax season was a good time to get a new or used vehicle, according to the Autolist survey. Thirty-two percent of respondents over 65 said it was a good time to buy a vehicle. An average of forty-eight percent of the 1,838 respondents overall thought tax season was a good time to buy a car. A majority of all respondents did not agree with the idea of using tax refunds to purchase a new or used vehicle. Seventy-two percent had never done that. One quarter of the respondents said they had used all or some of a prior year’s refund to get a vehicle, while 3 percent were unsure. In another ominous sign for auto sales, the Federal Reserve Bank of New York’s Center for Microeconomic Data released its January 2019 Survey of Consumer Expectations, which showed households were less optimistic about the economy and future changes in their financial situation. Survey respondents were less optimistic about future credit availability, and many expect to be financially worse off a year from now. Haig Partners acted as the conduit for a pair of Texas Toyota stores to change ownership. The firm represented Jerry Durant on the sale of Durant Toyota of Weatherford, Texas, and Jerry Durant Toyota of Granbury, Texas to the Shottenkirk Automotive Group. Founded in 1964, Shottenkirk Auto Group has grown to 15 dealerships in five states. “Our team is thrilled to join the dealer community in Texas, and we thank Jerry Durant for giving us the opportunity to buy his two Toyota stores,” Shottenkirk Auto Group chief executive officer Greg Shottenkirk said. “Jerry has set a high bar for delivering excellent customer service and we look forward to building on that legacy,” Shottenkirk continued. Haig mentioned that this transaction was the firm’s third closing so far in this year, while noting that Durant will not be selling any other dealerships. Jerry Durant said, “I will miss working with the talented staff at Durant Toyota and Jerry Durant Toyota, but I am looking forward to a little less stress and a little more time at the beach. “Greg Shottenkirk and his team turned out to be the perfect buyer for me, showing integrity and professionalism every step of the way,” Durant continued. “I welcome them to the Weatherford and Granbury communities. “I also want to thank Alan Haig at Haig Partners. He heard what I wanted and his experience in buy-sells helped make sure the process turned out just the way I hoped,” Durant went on to say. Haig of Haig Partners was the financial adviser to Durant. John Shackelford at Shackelford, Bowen, McKinley & Norton served as legal counsel to Durant. George Taylor III of Burr & Forman provided legal advice to Shottenkirk. “We were honored to be able to help Jerry achieve his goals,” Haig said. “Buyers continue to be extremely interested in dealerships in the great state of Texas, and Toyota remains one of the most desirable franchises. “The market for higher value dealerships continues to be highly active and 2019 is shaping up to be another big year for dealership sales,” Haig went on to say.